“Both of my parents were math majors, and my brother got his PhD in finance,” says Doug Balyeat. So, its not surprising that he majored in accounting, became a CPA, and spent more than three years in the audit division at Ernst & Young (E&Y) in Atlanta. But his career path didn’t end there. One day, while picking up documents from law firm and E&Y client Alston & Bird, he told one of the lawyers that he’d often thought about going to law school. “He told me to do it or stop talking about it,” Balyeat says with a laugh. 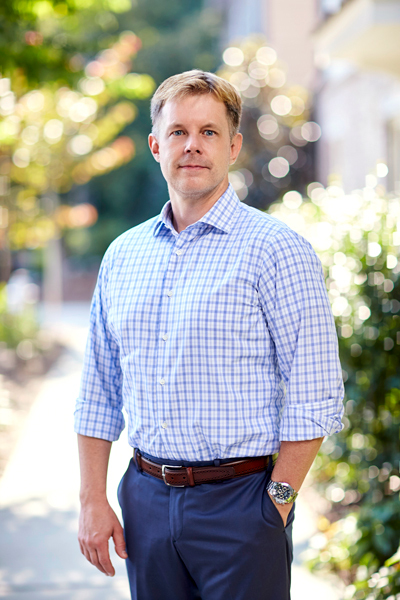 Following the lawyer’s advice, he took the LSAT and graduated from Wake Forest School of Law in 1997. “I thought I would go back to a large accounting firm and be a CPA with a law degree,” he says, but after some mentoring from a Wake Forest law professor, Balyeat accepted a position in Alston & Bird’s tax group. However, he soon discovered that “just because you’re good at something doesn’t mean you should be doing it.” When an opportunity opened up in the corporate group at Paul Hastings, it piqued his interest. Impressed with the firm’s international footprint, he made the move. Here is where one discovers an important thing about Doug Balyeat: his infectious positivity. He describes every juncture in his career path as “truly great” and mentions mentors at each stage—Jane Salter at E&Y and Paul Connell at Paul Hastings, for instance—to whom he will always be grateful. The combination of Balyeat’s accounting and legal skills have come in especially handy given Pratt’s growth trajectory. In 2015, the company bought Robert Mann Packaging Inc., which has more than a dozen facilities in the US and Mexico, for $60 million. And, a year later, Pratt acquired Minnesota Corrugated Box Inc. and its 250,000-square-foot plant for $70 million. Pratt, which is privately held, is also building a 470,000-square-foot recycled-containerboard mill near Wapakoneta, Ohio. The mill was partly financed via $210 million in tax-exempt revenue bonds, as part of the company’s plan to become more vertically integrated and reduce its need for third-party suppliers. The plant is expected to come online in late 2019. Helping navigate these and many other deals has resulted in numerous honors for Balyeat, including the 2018 Dealmaker Award from the Atlanta Business Chronicle and the Georgia chapter of the Association of Corporate Counsel.